So what are drones good for? Well a lot actually as it turns out. 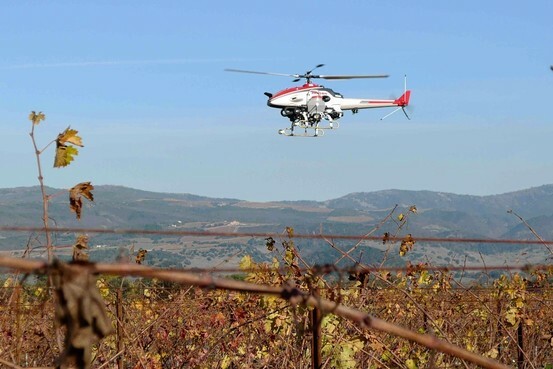 For example, I had the privilege of working with a top California Vineyard before harvest time, to investigate how Multirotor UAV’s could be used in vineyards to improve efficiency and identify crop issues. In the following I’ll highlight the workflow used, the results and some tips learnt the hard way. 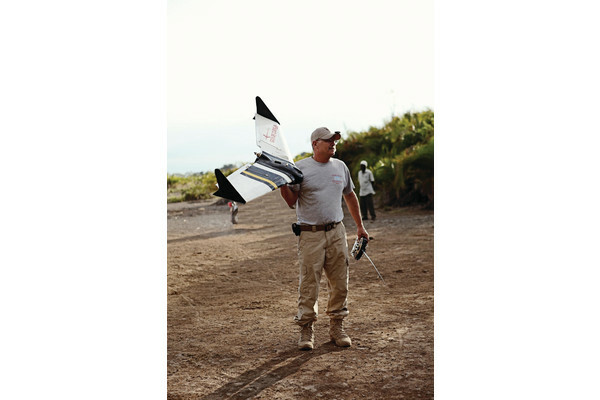 Which UAV platform and Remote Sensing Equipment to use? 1. Lift capacity and Endurance – Although this seems obvious, the UAV has to lift itself, batteries and camera/s into the air and fly the whole survey route. Working backwards, the UAV choice is therefore influenced by the payload or in this case the camera. I’ll explain more on this later, but for this test the payload weight was 8.15oz or 231g, or a point and shoot size camera. Add onto this a gimbal of approx. 100g; we needed to lift approx. 330g for approximately 12 minutes. Looking through specifications, the 3D Robotics Y6 was capable of this scenario, using a 4S 6000mAh battery http://store.3drobotics.com/products/3dr-rtf-y6-2014 Another option was the 3D Robotics X8, however we also wanted a copter that could fold down for transport, as such the Y6 with its foldable frame was selected over the X8. 2. Autonomous Flight with Flight Planning – When flying large areas of crops, flying manual and getting the correct overlap on images is near impossible. As such the UAV needs to be flown in an autonomous mode. This requires that the area to be mapped is stored in an electronic flight plan in the UAV, and the UAV flies from each assigned point or waypoint at a specific speed, altitude and orientation. This also allows the mapping mission to be flown, time and time again, days, weeks and months later. This is important, as it allows images from different dates to be compared side by side, allowing crop analysis over time. As we were flying 3D Robotics Y6 we had a choice of Pixhawk or APM autopilots. The UAV was initially a Y6A with AMP2.6, however for this mission the UAV was converted to a Y6B (mainly as this was better supported) but still with an APM2.6. In the future we will look at using the Pixhawk for the Y6. The APM2.6 has a long history in UAV autonomous flight, so this was the chosen platform. 3. Camera – The data is only as good as the images, as such the camera is critical. This data quality is a trade-off in a number of factors, weight, resolution, control, imager size, cost etc. We have a defined weight of approx. 200-300g as an acceptable payload weight. This places us in the point and shoot category. The camera must also have an NDVI capability. Also the camera needs to be setup with the correct parameters and also be triggered by the UAV, which the APM2.6 can do. This combination led us to use the Canon series of point and shoot cameras. Presently the SX260HS, S100 and S110 can be converted for NDVI and are used by companies such as Agribotix, Sensefly, Roboflight, Quest UAV etc. To simplify operation, the camera used was the SX260HS, as this has an on-board GPS, allowing for each image to be geo-tagged with GPS coordinates. This helps with the image processing later. The Canon range of cameras also are supported by an application called CHDK, which is placed on the cameras SD card. This supplies the camera with additional functionality, such as triggering from the UAV, interval timing shots, setting white balance etc. The camera is also 12.1Megapixel, for flying at a height of approx. 100 feet, with a ground resolution of approx. 1cm per pixel. More than enough for crop analysis, and flying up to 400 feet still gives excellent imagery for analysis. Finally as previously mentioned, the cameras need to be NDVI capable. This was achieved using an Event 38 NGB, near infrared, green, blue filter with the red spectrum notched out. A tutorial on how to convert the camera is defined here, the process is relatively simple. So the remote sensor is a Canon SX260HS with GPS, fitted with an Event 38 NGB NDVI filter, with CHDK software mounted on the camera SD card. 4. Camera Gimbal – Flight time is a trade-off of thrust versus weight, as such the lightest simplest quality gimbal was researched. Gimbal categories can be split into 3 main areas, simple servo gimbals, high quality servo gimbals sometimes with gearing, and brushless gimbals. The purpose of the gimbal is to allow the camera to take high quality images of the crop. To do this a number of issues must be addressed. Firstly the gimbal needs to keep the camera pointing straight down. This keeps the overlap on the images which I’ll explain later, even when the UAV is tilted when flying forwards or into crosswinds. This also stops blurring, as the camera is stabile in pitch and roll, thus not been moved around by the UAV movements. An important factor in this is the gimbal movement should be smooth. Secondly, the camera needs to avoid any vibration that could blur the images; therefore the camera needs to be isolated from vibrations of the Multirotor. This is normally achieved using rubber isolation grommets between the camera gimbal and the airframe. Thirdly, it should be light and simple, the more complex it is the more chance it will go wrong in the field. Finally it should be cost effective. Based on these criteria, we need a smooth movement gimbal in pitch and roll, good vibration isolation, simple and light, and approx. $300. Simple servo gimbals although simple and light, can have sloppy or sharp movement, whilst brushless gimbals are very smooth as they are required for video work, tend to be more complex and heavier. As such a high quality servo gimbal was chosen, the GUAI Crane II which cost $279. It does not have any associated electronics as per brushless gimbals, instead using the UAV flight controller for gimbal control. An advantage of this gimbal is that it also allows the gimbal to be removed easily from the isolation damper for packing/traveling. 5. Camera setup – Again, the final analysis is only as good as the data used, which means you need good quality images. For UAV aerial images, there are a number of trade-offs, such as ISO settings, the aperture, auto-focus, shutter speed, white balance, image stabilization, image capture time etc. The main aim is to get a sharp image with the least amount of noise. Also the image quality is affected by the light quality, with results changing between a sunny day and a cloudy day for example (see Agribotix for further analysis on this.) Normally the following setting work and were used, white-balance sunny day, zoom set to wide angle to maximize image view, auto-focus off to speed time between images and focus set to infinity, aperture set to automatic, image stabilization off, shutter speed set to a medium such as 1/800, ISO set as low as possible to avoid noise. OK, so we have the UAV the 3D Robotics Y6, the 3D Robotics APM2.6 autonomous autopilot, a Canon SX260HS with GPS, fitted with an Event 38 NGB filter, mounted in a GAUI Crane 2 gimbal. 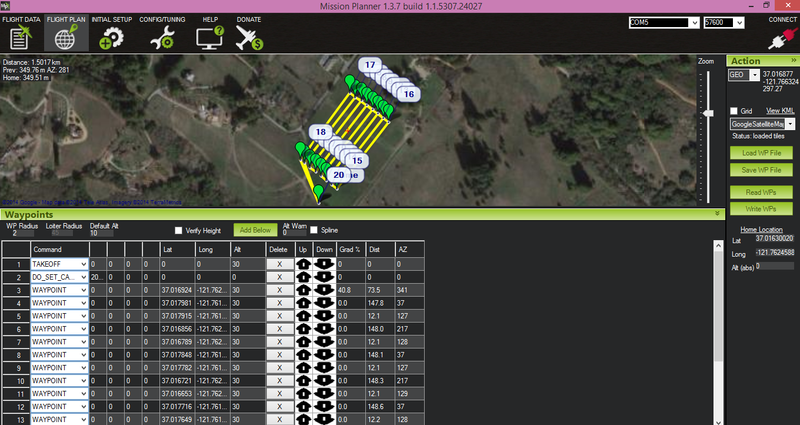 The flight planning software for the 3D Robotics Y6 is called Mission Planner (http://copter.ardupilot.com/wiki/mission-planning-and-analysis/) and can be used to devise flight plans, configure the UAV, plus monitor the UAV in flight using a telemetry link. One useful point when planning a mission is to use a site survey if nearby, to access the safety and understand the terrain or any obstacles or special circumstances that need to be taken into account. Once this is done, Mission Planner can then be used to draw the survey map. This survey grid is then converted to waypoints with flight altitudes, and uploaded into the UAV. 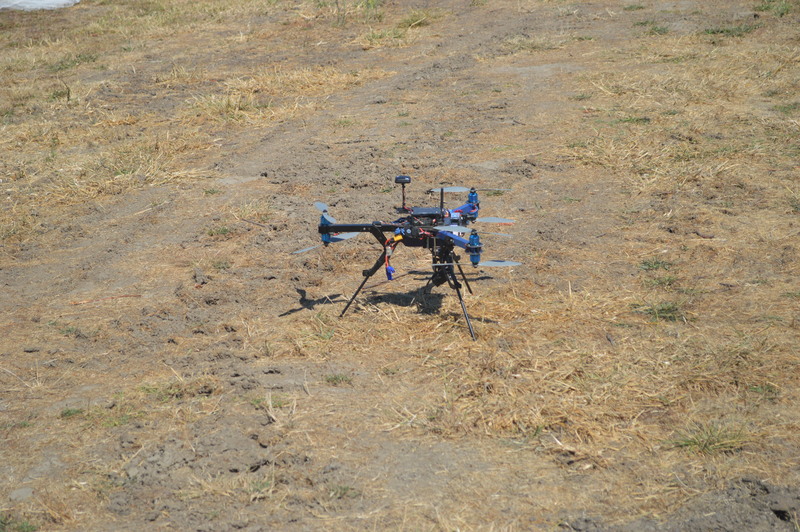 Meeting the vineyard owner, a survey site was identified of approximately 7 acres, which kept the UAV away from trees, power lines, workers and an on-site event which was been setup. The site was focused on the middle of the vineyard with some elevation change involved. This is very common situation in the Santa Cruz area, where the vineyards propagate through the Santa Cruz Mountain region. 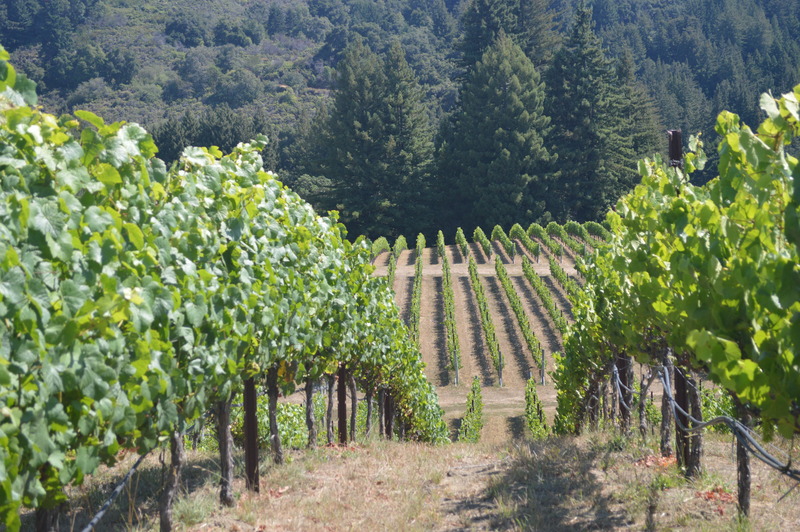 Normally this is also associated with the vineyard been surrounded by tall trees such as Redwoods, which in turn leads to a large bird population. The upshot of this is the vineyard headache of birds been pests, which leads to most Santa Cruz vineyards using netting to protect their crop. However on this day only some of the crop was netted, so the majority of work was over the un-netted area. As mentioned before the site had been pre-planned via Google Earth and a number of possible missions planned and stored. Therefore all that was required was to upload the correct mission the Y6. Firstly the NDVI NGB camera was loaded, turned on and allowed to get GPS. The mission was then started a survey grid flown with no issues, except one. When the mission was preplanned, the landing site was in the center of the vineyard, however the take-off and landing site was moved to the top of a hill to get better observability of the UAV during the flight. The exception was that the take-off site was changed, but the landing site did not reset correctly. The result was at the end of the mission, the UAV attempted to land at the other end of the vineyard in the old landing spot. This was easily overcome by going to manual and flying it back and landing by hand. However the moral is, when you program a mission to a UAV, always read it back to make sure all changes are correct. 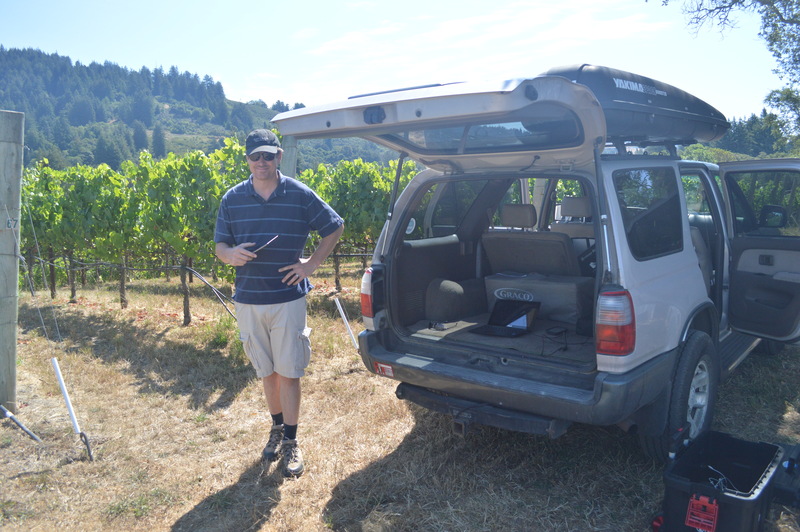 Also always pay attention, have an observer in my case Josh Metz, Vineyard GIS Specialist @Geovine , and always be ready to take control back. After the NDVI RGB camera flight, the camera was swapped out for a normal RGB camera, and the mission flown again. Again, this is the advantage of autonomous flight, both NGB and RGB doing two flights but over the same flight path. This survey was based on Pix4D who kindly gave us a Demo License for this investigation. The purpose of this software is numerous. Firstly it corrects for camera issues, as such the camera model used is added as input data, the separate images are uploaded and then the software joins all the separate images together in a point cloud. From this a single large image is generated and then numerous other outputs such elevation models, 3D models, plus NDVI data plots as outputs. The output formats are numerous, with Geo-Tiff been a primary output. 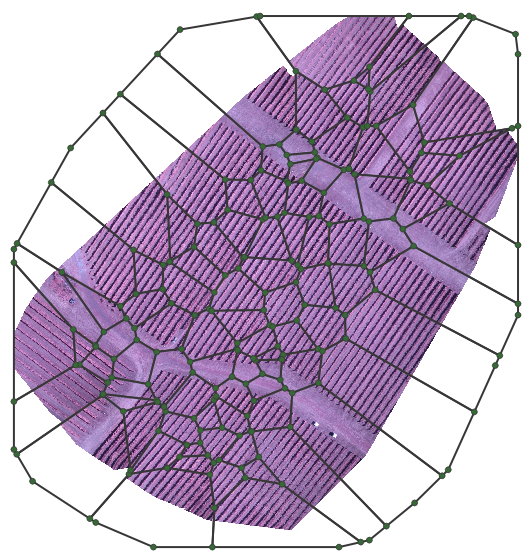 To help the software align the images, ground control points can also be added, which gives known reference point for the software to stitch the images together. To get a complete stitched image, all the images must overlap. The required overlap is normally 60% to 80% to allow the software to stitch properly. As such you need lots of images, and the lower you fly, the more images you need. The downside of this is that you must process more images, which takes more time. This process requires a fast computer using lots of memory, such as an Intel i7 running 32 or 64GB of memory. So two lessons fly as high as you can, but no higher than 400’, and have a very fast computer. Pix4D did an excellent job of stitching the NGB NDVI images together, but issues did occur with the RGB images, although this was not a software issue. The GPS on the Canon SX260HS RGB camera had not geo-tagged the images correctly. However just using the Pix4D ground control points, the software was still able to stitch the RGB images together. NGB Point Cloud showing the UAV position when the image was taken. NGB Mosaic Image, showing the separate images stitched together. 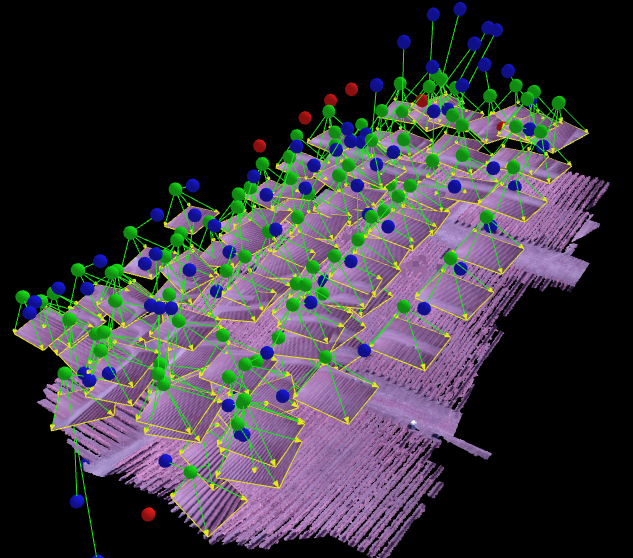 RGB Point Cloud, where the images were stitched using just ground control points with no GPS data. RGB Mosaic with all the stitched images. The NDVI image was generated using the NGB bands processed by the Pix4D software. 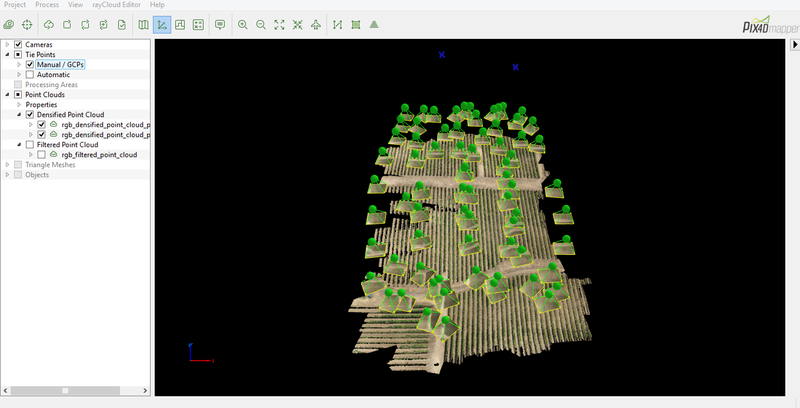 A quick explanation of the image brings to lights some details with NDVI imagery in vineyards. Firstly the dark blue is actually due to shadows on the ground between the vineyard rows. This was because the survey was flown in the morning around 10:30am, rather than noon with the sun directly overhead. The green indicates the ground. The red indicates the separate vines. One of the main items to notice is where you have good vine virility and growth, you see red vines and the blue shadows. Where growth is low the vines in red are less obvious and the shadows (blue) less strong, and the ground (green) more merged together. Using this information it can be see that certain areas show lower growth and yields than other areas. After the data was processed, we went and talked with the vineyard owner, and compared ground data with our results. It was obvious from the discussions that the ground data and the UAV NDVI and RGB images both highlighted low yield areas, which were known to be lower than the rest of the vineyard due to soil type, irrigation etc. As such the UAV images with Pix4D processing were shown to have been able to correlate well to ground data. It also became clear that the owner knew his vineyard very well, as it was approx. 17 acres, so he and his staff could walk the property and identify issues on the ground. As such UAV imagery only becomes effective as a business model when the property cannot be efficiently walked. At this point the UAV is indispensable in its ability to capture large areas and process data. 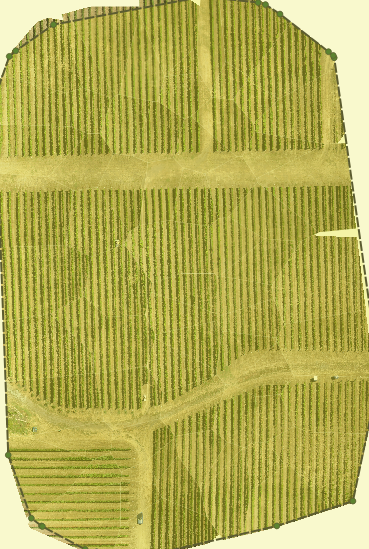 One advantage of UAV imagery that needs further investigation though, is that RGB images do not show yield issues that easily when the vines are netted, however preliminary analysis shows NDVI NGB images can show yield issues even when the vines are netted. 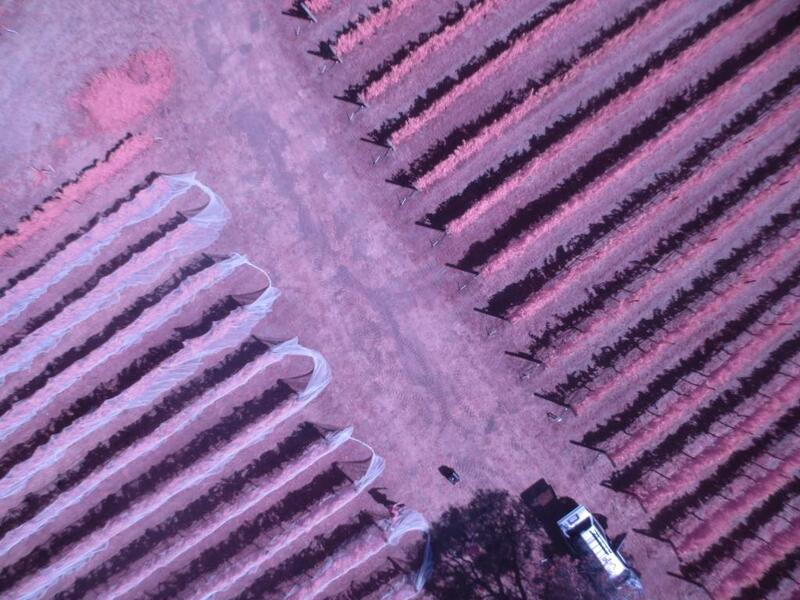 So we have shown how a UAV such as a 3D Robotics Y6, mounted with a simple Canon point and shoot camera modified with a NDVI filter, using powerful software such as Pix4D, can generate useful crop analysis for vineyards. We’ve pointed out lessons learned and are now ready to keep on helping the Santa Cruz Mountain Wineries stay the best in the World. A couple of weeks ago I spent a day at the sUSBExpo in San Francisco, organized by Patrick Egan (Thanks Patrick great job.) Quite a few people have covered the Expo already, so I’m going to focus on it from a different angle. 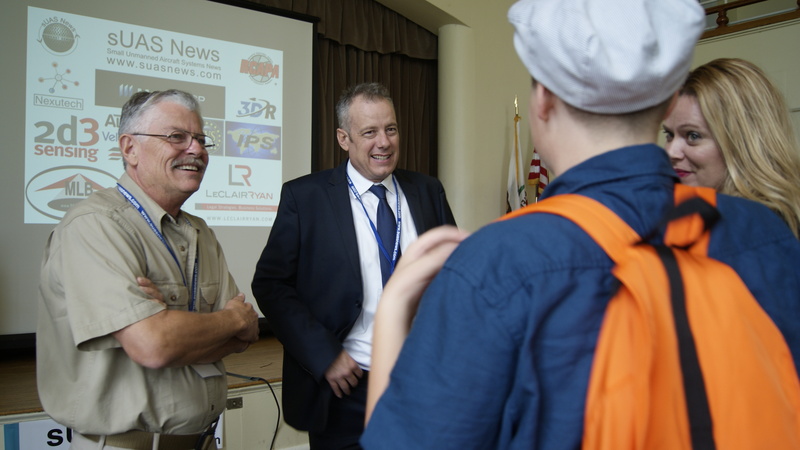 I had the privilege of attending the Search and Rescue Workshop presented by Gene Robinson. This was a sold out workshop, but even so Patrick managed to get in most people who wanted to attend. 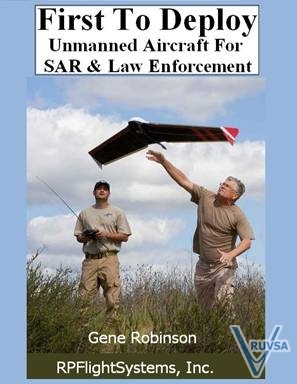 Gene Robinson has been a pioneer in the use of UAV for search and rescue, starting more than a decade ago. This is truly a humanitarian focus and Gene runs all his SAR work through the non-profit RP Flight Service (http://www.rpflightsystems.com/MainPage.html) /RP Search Services (http://www.rpsearchservices.org/) and working with Texas Equusearch (http://texasequusearch.org/). He was recently awarded the Recipient of the Spectra Humanitarian UA Award. If any one person is an advocate of the peaceful community based role for UAV’s, it’s Gene. Gene uses his own fixed-wing UAV called the Spectra, using a Robota Goose Autopilot (http://www.robota.us/Autopilot/b/8829483011?ie=UTF8&title=Autopilot). Normally he flies with a 12Mps digital camera. His philosophy is simple, keep it simple, always have a back-up, plan and practice. How do you see this in his operations? Well the Spectra is a flying wing, with only 3 moving parts, two elevon servos and an electric motor. This is a design and requirement based on experience of what works and Gene has lots of it. For example, will your autopilot work below freezing, will it work at 120’F in the desert, will you LiPo batteries have full capacity at launch when it’s cold, and should you change your propellers when flying at altitude? Gene explained all this and more, with a very straight forward and simple way, but drove the message home. Here’s another example, you’re on a search in a desert, are you going to be any good to the Incident Commander if you’ve got sunstroke because you haven’t got any cover? It was absorbing to hear of the fire monitoring, and search and rescue missions he has been involved in and made a difference. The number of searches he mentioned where the ground searches had been through an area with a tooth comb, and not find the missing person, only for Gene to find them later. It’s not that the ground search teams are doing it wrong, it’s a resource issue. To find a missing person, you need to be able to see the feet of the searcher next to you, if you don’t your too far apart, and can walk straight past the person you are trying to find. 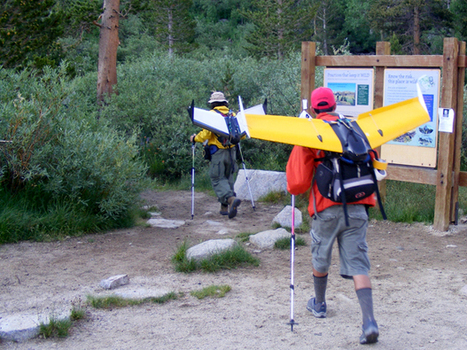 So if someone is lost in Yosemite, how many ground searchers would you need?! The sad part is, is that Gene now has issues with the FAA. Although RP Search Services is a non-profit and Gene pays for everything himself (that’s about $4000 of equipment he throws in the sky knowing he may never get it back, people come before machines and he’s willing to lose it to save lives) they consider him flying search and rescue as a commercial operation, which according to the FAA is illegal under there regulations (that is a whole other story.) As such Gene has retained Brendan Schulman, a pioneering UAV Attorney to take the FAA to court to resolve the issue. The heartache of the matter is that until this is resolved, Gene is not flying SAR within the USA. What is worse, a lot of missing children are small children, can you imagine having a resource such as Gene on hand to find your lost child, but the FAA forbids it? The next Saturday morning we went on a birthday party with my young daughter in a forest. The first thing I did was take a picture of my daughter. My wife having known that I’d been to Gene’s workshop said “You didn’t do that as a birthday party picture did you?” We also taught her a new rule, if you cannot see our feet your too far away. She’s still checking our feet to this day. Thanks Gene, you are a real gentleman and humanitarian. Thanks for the workshop, the knowledge and the peace you have brought to families of missing people. 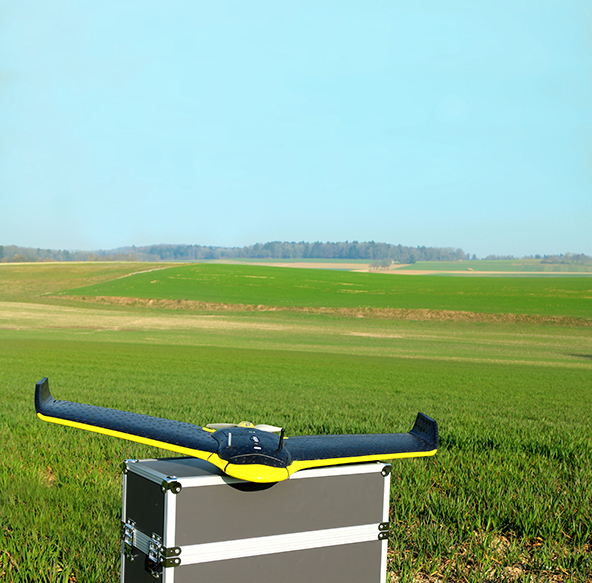 Which Aerial Platform to use for Precision Agriculture? In my previous post I discussed how UAV’s can help with Precision Agriculture. In this post I’ll discuss the platforms that can be used at this time, ranging from off the shelf complete packages, to do-it-yourself airframes. So one thing to note is that no single platform is suitable for all applications. The type of platform is dependent on a number of factors such as land topography, area of coverage, environmental conditions such as wind, direction and cloud ceilings. For example a small vineyard with elevation changes in a mountainous region is going to require a different platform, than a large artichoke field which is flat and near a windy coastline. Both these scenarios require different platforms. 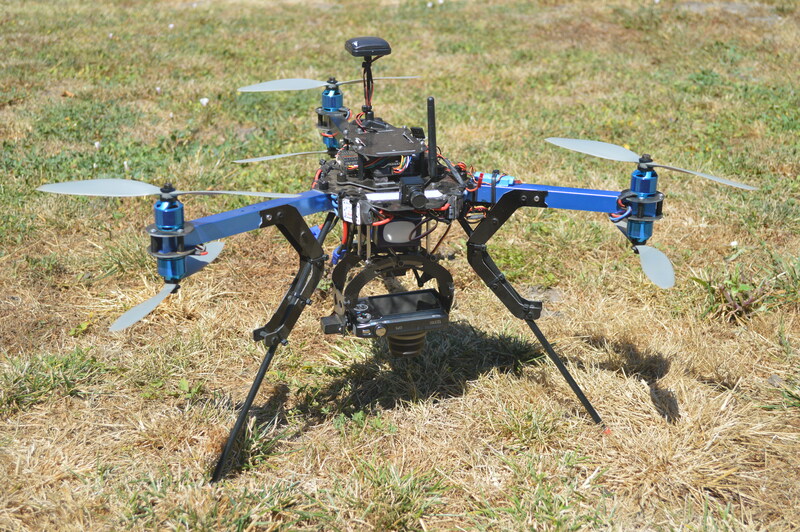 In general multirotors are great for small aerial PA projects, 0.2 sq mile. They have endurance of approximately 20 minutes allowing coverage of smaller areas, have good wind resistance to approximately 20 to 25mph dependent on model, can cope with rapidly changing land elevations, and can fly lower for higher resolution. Also the take-off and landing area requirements are significantly smaller. The downside as mentioned is their limited range, which means that for large areas multiple flights are necessary with associated image stitching and complication. For medium to large areas, 4 sq miles, fixed wing platforms dominate. The reason is endurance, fixed-wings as the name suggest generate lift off their fixed-wings, so as long as they have enough forward motion to generate lift they stay airborne. In a multirotor all the lift comes from the motors and propellers. If both a multi-rotor and a fixed-wing use the same battery, the more efficient fixed wing will be able to fly much longer. Normally up to 3 times as long. So what are desired requirements for an aerial platform? Well for anything aerial safety is key, and the lesson learned from manned and RCMA (RC model aircraft), is that redundancy is key. On a multirotor, the lower the number of rotors you have, the more catastrophic the event if a motor or propeller fails. Losing a propeller or motor on a tricopter (3) or quad copter (4) will normally always result in a crash. Using Y6 (6), and hexacopter (6) formats allows for a motor/propeller issue, but for the platform to be landed. The same is true of X8 (8) and octocopters (8). Another area of redundancy is servicing and repair. Multirotors as the name suggests are made from a number of motors which operate in tandem to control the flight of the UAV. Normally the motors are the only moving parts on a multirotor except for maybe a gimbal. As such there are less moving parts to fail. The safety concern with multirotors, is that they have no lift mechanism other than the motors and propellers. The problem here is that if the motors stop, they just fall out of the sky. On a fixed-wing, if the motor/s stops, the wing still generates lift and you can glide to a landing. Now fixed-wing moving part failures tend to be catastrophic in failure, unless there are redundant actuators. On a generic fixed-wing airframe you have actuators that control roll, pitch, yaw and throttle. Normally that translates into two independent airelons for roll, two elevators which are normally joined for pitch and a single rudder for yaw. That equates to 4 actuators/servos and a throttle control. To increase safety this can reduce to two airfoil actuators and a throttle control. Here the pitch and roll are combined in what is termed an elevon system, where the left and right ailerons are moved in combination. Both airelons up induces a climb, both aileron down is a dive, left aileron down, right up is a right roll. Now if the left aileron is moved up and the right aileron is left neutral, the plane with roll left and pitches up. This type of control is normally associated with airframes that are called flying wings. To further increase safety, multiple actuators can be also placed on a single airfoil, as such if one fails, the other takes over as a backup. So what we are doing here is reducing the number of moving parts that can fail, and where we cannot minimize anymore, then add redundancy in the form of parallel actuators or motors. Another key area is auto-pilots, just like you Windows PC rebooting and installing updates without warning, you need to ensure you have a safety-critical autopilot. If you autopilot reboots in mid-air, on your multirotor the motors will stop and it will just fall out of the air, on a fixed wing it may glide off into the sunset. Other safety issues are flyways, this can be due to poor autopilot firmware, GPS glitches, power supply spikes etc. Ensure you are using certified autopilots with stable code, good supply distribution, and high quality GPS and even redundant GPS units. In some cases redundant telemetry, RC receivers and autopilots are also employed. A final safety feature is geo-fencing. Here an invisible fence is placed around the flight path by the mission planning software. If a geo-fence is breached, such as due to a failure of GPS loss of lock, GPS glitching, lost telemetry link etc., that the platform returns to the takeoff site and either loiters allowing a manual landing or auto-lands. Safety is key, this industries growth will be defined by how safe it is. It’s great buying that cheap UAV or airframe from overseas, but what happens when you have a rough landing? Can you get spares readily? This is an important consideration, if you ding a wing, you don’t want to wait 2 weeks for international shipping. Makes sure you either have an inventory of spares, or have a nearby dealer who has a good supply. It’s true that the fun focus is on the flying, but flying is only 20% of the overall work. The other 80% is flight preparation, post flight and then data retrieval and processing of the images. However you can have poor images due to poor camera choice, no gimbal or a badly stabilized camera gimbal, badly designed autopilot or inefficient stability algorithm, a badly setup multirotor with bad gain settings, poorly balanced propellers etc. All these issues can lead to inferior image quality. And as with most processes, if you put bad images in, you are going to get poor data out. As such although flight time is only 20% of the process, it is key to getting quality data. So you need to look for a good camera which has approx. 12Mega pixel, with the best possible dynamic range, with integrated image stabilization. The cameras are normally modified with new filters for NIR etc. I’ll discuss cameras and modifications in the next blog. At present the go to camera is a Canon S110 with NIR using filters from people like Event 38. Other cameras such as the Canon SX260 and S100 are also used. You notice the predominance of Canon cameras, this is because they are easily modified for filters and updated with control software called CHDK. For fixed wing operations having the camera hard mounted to the airframe is the norm. Normally due to the forward speed of a fixed-wing platform and the autopilot, it is normally flying wings level during image capture. On multirotors, due to wind effects, direction of travel, the airframe can be leaning into the wind/direction of travel, and as such a 2 axis gimbal is normally used. 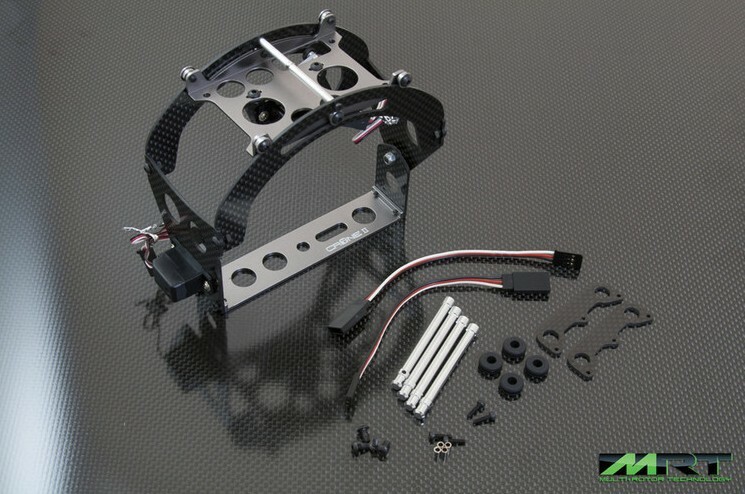 These gimbals can be servo or brushless, as this is still pictures a quality servo gimbal can work as well as a brushless gimbal, without the associated cost. The gimbal levels the camera and removes any autopilot sudden corrections. Autopilots are very important for image quality, a poor autopilot can wander off path giving incorrect image overlaps, jerkiness in control response and just about spoil your day. Pro – Well integrated package using S110 cameras and PIX4D software. Very small. So the question is do you spend $25,000 on a senseFly eBee AG or do you buy a 3DR Aero for $1350? Same with the multirotors, do you spend $25,000 for an Aerialtronics Zenith or $1350 for a 3DR X8. I guess it depends on how deep your pockets are. Thanks for reading, next posting will be about cameras for PA.
No matter if you call then small Unmanned Aerial Systems (sUAS), Unmanned Aerial Vehicles (UAV) or the ubiquitous “Drone” moniker, UAV’s have massive potential in farming. Normally if you think about farming, you’d probably think about a farmer driving his tractor and caring for his cattle. My uncle owned a farm in rural Yorkshire in England, and I spent many summer working on his farm, so I thought I knew a little bit about farming. As it turns out I really had no idea. Today farmers are at the forefront of technical innovation, and this methodology is generally termed “Precision Farming”. In Precision Farming (PA) tools are used to observe, measure and then react to variances within a crop. This allows farmers to determine if crops are under-watered, need pesticides etc. In this manner rather than treating a whole field/s, with water, pesticides, the areas that need treating can be identified and only they are treated. In this way, yields can be increased whilst using less resources such as precious water. So what tools do PA use, how do they process the collected information, and how to they use that data to make decisions? PA is formed around GPS and the ability to define exactly within a field, specific conditions that exist. By mapping these crop variances to a map location, then a recipe map can be derived which identifies what treatment the crop at location X,Y should have. As such, a single field can be broken down into lots of tiny sub-plots and the crop treatment tailored to that tiny sub-plot area. Presently the observation is generally ground based, and uses such tools as GPS enabled tractors and combines monitor chlorophyll levels, water status and spectral monitoring. The collected data, is then processed to generate NDVI (Normalized Difference Vegetation Index) maps, where crop stress can be identified and treatment undertaken by GPS enabled seeders, sprayers etc. Presently NDVI mapping is expensive due to it been time and labor intensive for land based systems, and expensive when employing aerial or satellite mapping. The major benefit of the UAV is in collecting data to generate these NDVI maps, in a short time, at a low cost and with good accuracy. It’s the latest tool in the PA toolbox. So how can UAV’s help? Well with the advent of multirotor aerial systems with autopilots, you can plan a NDVI survey flight in a relatively short time. 4. 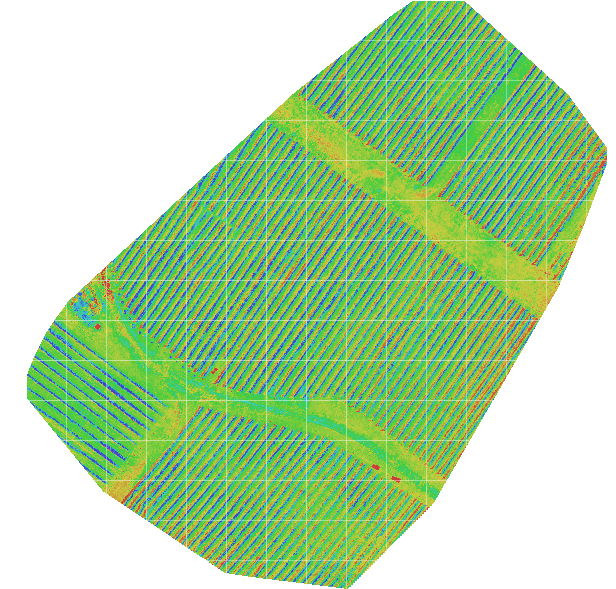 Post Analysis Software, which stitches the many photographs together and then processes them to show crop stress analysis http://pix4d.com/ Using this NDVI map the recipe map can then be derived. Once you have these tools, it is relatively simple to plan and execute a mission. Today’s PA UAV’s are designed to be user friendly and operated via laptops, tablets or even smart-phones. The requirement to be able to know how to fly these multirotros is removed, thus removing the barrier to using them just as tools. Today you don’t need a Ph.D in Aeronautics to be able to capitalize on this technology. It’s been designed to be user friendly and safe, but also intuitive to use. If it’s not, why use it? So this is a brief introduction to using UAV’s in PA. In the following blogs I’ll cover the 4 points above, picking a multirotor, NVDI cameras, planning a mission and then the post analysis. Also I’ll cover important aspects such as safety, UAV regulations and current news. What happened at the AMA Expo 2015? God is my Co-Pilot……or is it Drone Deploy?